A seven-year-old west London boy has now raised more than £145,000 for Haiti quake victims in a sponsored bike ride. Charlie Simpson, from Fulham, had hoped to raise £500 by cycling five miles (8km) around South Park on Sunday for Unicef's relief efforts in Haiti. A day after his five-mile ride Charlie said: "My legs are a bit sore after the ride, but it was really fun." His effort led to donations pouring in on the JustGiving website from as far away as New Zealand and Hong Kong. Charlie, who went back to school earlier, is still unaware of how much he has raised but Unicef said he will be told when he visits its office later. Charlie's father Dan Simpson said: "We cannot believe the incredible response from the UK public. "Charlie is so grateful to people for sponsoring him and he is delighted his bike ride has meant Unicef can help so many children in Haiti. "Thanks to everyone who has taken the time to donate and thanks for all the messages of support, they really mean a lot." 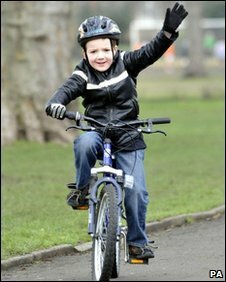 His family said the ride had begun as a "little cycle round the park with his dad". Michael Newsome, director of fundraising at Unicef UK, said: "Everyone at Unicef is absolutely staggered at how much Charlie Simpson has raised. "His donations will mean we can help thousands of vulnerable children in Haiti." He added: "Charlie spoke out about Haiti and the UK has listened - we are so proud of him. "We would now encourage other people inspired by Charlie to try fundraising themselves to help Unicef's vital work with children in Haiti." Before the bike ride, Charlie wrote on his JustGiving page: "I want to do a sponsored bike ride for Haiti because there was a big earthquake and loads of people have lost their lives. "I want to make some money to buy food, water and tents for everyone in Haiti." The final amount raised by Charlie will be increased by a Gift Aid supplement.